Yup, it was the lowly lockring on the 11x32t cassette that was ultimately the source of the “clicking” sound. The lockring had developed what appeared to be a hairline crack and was no longer holding torque on the cassette. The less-than-spec torque on the lockring allowed the cassette cogs to separate enough on each of the power-strokes to make an audible sound. On hard, out-of-the-saddle climbs that cogs moved around enough to create chain chatter much the same as you’d get if you had a lot of frame flex. So, I’m quite relieved that we have solved these latest issues. Of course, tandems being tandems, as soon as the clicking was gone a new rubbing sound appeared on the left side of the bike. And, if that weren’t bad enough, a saddle rail failed on my 10-year old Selle Italia TransAm Flight saddle 6-miles from the end of our Saturday ride at the 2018 Southern Tandem Rally. 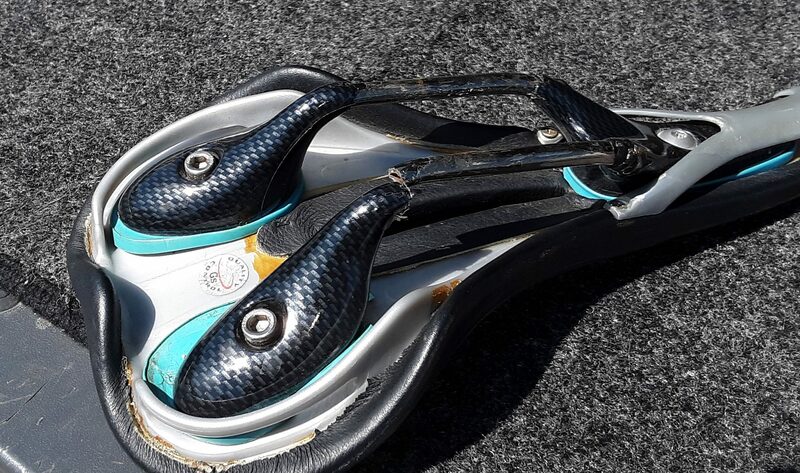 This is the 3rd, identical saddle to suffer this life-ending fate during the past few years. Thankfully, a local bike shop in Venice (Bicycle International) had several performance saddles in stock and I took a leap of faith that the Bontrager Montrose Comp saddle was “close enough” in design and stiffness to make for a painless transition on Sunday’s ride: it was! In fact, I’m not sure I could tell the difference so I’ve now got a new ‘go-to’ saddle if I need one. Bottom Line: We’re still in love with our Calfee Tetra Custom Travel Tandem. It continues to deliver an incredibly comfortable ride and has more than enough “gusto” to efficiently transfer all the power we can generate to the tires and pavement. If we had to replace our Calfee there’s no doubt that another Calfee would be at the top of our list. Colin Chapman made incredibly light and fast race cars, with the philosophy of starting with the incredibly light and then replacing those parts that broke with heavier duty parts. I’d suggest you start with your Calfee and saddle. Light, durable, expensive pick any two. I think that is attributed to Keith Bontrager. Glad you found the issue. Chasing clicks and creaks can drive you nuts but they do compell you clean and check your bike. It’s actually light, durable, cheap. We have been chasing a similar demon noise for a year now and with to LBS and two tandem shops looking and throwing parts at it. It’s only on the pedal stroke and doesn’t start up till about the 5 mile mark… flat or a slight grade doesn’t matter.